Holes or Furniture? – I'm a Writer, Yes, I Am! Adorable. Loki has been an avid tv watcher with me during the day, when I’m not blogging or involved in a myriad of things. He’s taken to barking at other animals on tv, especially dogs, but not limited to dogs. He (in particular HATES camels) but loves birds. It’s been a bit exhausting trying to teach him they aren’t real, they haven’t invaded his space. He now lays in front of the tv, sleeps through the movie unless animals are involved, and awaits the ads and every 2nd or 3rd ad, you guessed it, has animals! He can be sleeping in the bedroom, hear a trumpet and know the damn dog is going to show up! He hasn’t forgotten once. Pretty amazing. He’s also taking guard duty quite seriously. My daughter was cleaning the eaves and throwing the mulch and gunk on the ground. He heard it and barked and stood between me and the sound. They moved to the back of the place and he stood between that room and me and grrrrd. Not barked though. I can handle grrrr I can’t handle rip snorting barking as in power barking! lol. I love, “Power barking” Great phrase! Now, that is comfort! Every angle taken care of. Good for you, Bear. Bear is a great guardian. I hope she doesn’t run away again, but it sounds as if she knows well how to do her job! 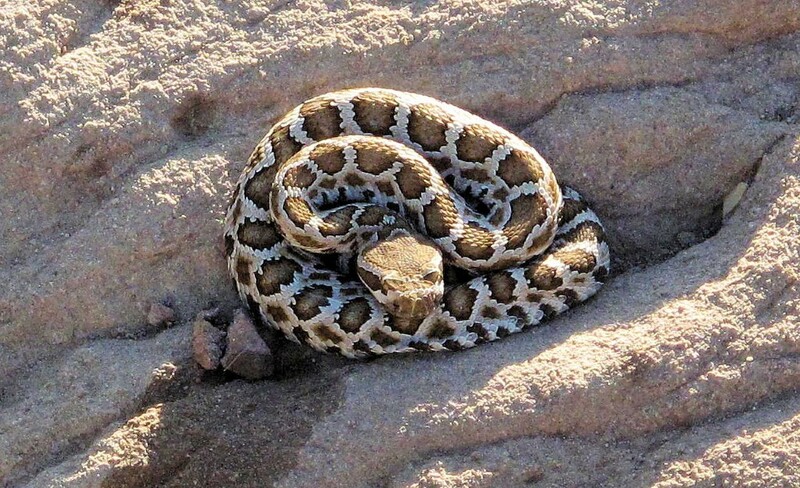 They are warning us here to watch for rattlesnakes when taking dogs for their walks — it’s hatching season! I’ve also set up the back of the car so she’s fastened in and can’t leap out as she did the day she ran off. Poor dog. I’m pretty sure it was as traumatic for her as it was for Dusty and me. That’s a good idea, as restricted as it is, to keep her fastened into the car. It will take a while for “life to get good again,” though, if she has to wait for the cold — snakes are a danger all summer here, though they are worse right now. We’re being told that they have been storing up all that venom all winter (that sounds a little elementary to me, but I know the young have more powerful venom than the older snakes)! As you know, in San Diego, I got a lot of snake experience. It’s not so much that young snakes have more powerful venom, they haven’t learned how or what to strike at. They’ll use the whole charge on a small mouse. My experience with the snakes du jour hiking around San Diego was big snakes are just not interested if you’re not food. Little snakes are very unpredictable. I’ve seen enough of them to last my lifetime, but I might very well see more. In San Diego I figured snake season was Valentine’s Day to Thanksgiving. Here, of course, it’s much shorter. Snake here are pretty much restricted to the foothills and the plains. If you go high enough it’s too cold for them and summer is too short. Here they live with their main food source, prairie dogs. Nature is bizarre. That’s interesting about the little snakes not knowing what to strike at and the older ones striking only when they think it’s food. I wouldn’t have thought they had enough brain to learn that, but, as you said, nature is bizarre! That really does make sense that the prairie dogs would be the main food for them. The only time I’ve seen a rattlesnake was on a trail in Laguna Canyon. We had hiked up to a point that I would have had to put a hand on a rock above my head — I wasn’t willing to do that because I didn’t know if a snake might be sitting on that rock. On the way back, when the trail widened out and flattened, there was a snake stretched out across the path (a jeep trail at that point). As we backed up slowly (looking carefully behind us), the snake coiled and sat there for a while. It finally relaxed and headed off into the grasses. I agree — I wouldn’t have wanted to rely on its good graces for very long! I watched a ground squirrel protect her babies from a rattler — the rattler finally just shrugged and said, “this isn’t worth the effort.” It was pretty funny. I would also not put any body part anywhere that I could not see what was there. I won’t even step over a log in the trail. On, OK. Over, no. Wow — a ground squirrel won over the rattler! Agreed — I refused to put my hand on that rock, and we turned around — that was the outbound end of our hike! The mom ground squirrel had four little ones behind her. The snake was coiled and ready, a really big snake but not a baby, maybe 18/24 inches. The mom chattered at that snake, giving him holy hell basically — “take me, not my babies, you SOB” but he didn’t want her. Adult ground squirrels are resistant to rattlesnake venom, but the babies aren’t. This went on a while as I watched. Finally, the snake really did seem to shrug. He turned and went off into the bushes and the mom and her babies went on their way. How interesting to watch that, especially because nobody met their demise! Rattlesnakes and I are long-time acquaintances. It is hard to hike a few miles into the backcountry and NOT see them. My dogs get rattlesnake avoidance training, the shock collar kind with real snakes. It works. When they see a snake they back away and let loose a growl that sends shivers down my spine. OTOH if a dog doesn’t see a snake, the snake is smart enough not to move because they realize they are on the menu. Dogs = coyotes and wolves to a snake. A dog can walk right over a rattler and not see them and the snake will freeze perfectly still. Seen it often enough. If the snake does bite the dog, the dog could kill it long before venom kicks in. A big dog can handle venom better than a human but it is still life-threatening. I used to carry a vial of antivenin with me when hiking but whoever makes the stuff has increased the price per vial from a hundred bucks to several thousand. Rattlesnake avoidance training is the best thing to protect dogs. After I lost two dogs to a snake in my yard in Descanso, all my dogs got rattlesnake avoidance training. When I was a boy, for a long time we had dachshunds. They rearranged things as well. They dug many feet back into a pile of horse manure where they would retreat when it was cold out, only wanting to leave to come in at night to sleep on my bed. They would dig holes in deep grass where the unwary could suddenly step into a hole that was knee deep. The steps to our front door doubled as a dog house. They dug a tunnel under the steps and along the side of the house that any prisoner of war escapee would have been proud to dig. One of Bear’s holes is rather melancholy. It’s a deep hole on the north side of the fence, the last spot where the snow remains. It’s her favorite hole in summer, though it’s as hot as anywhere else. If he is underground, it will be cooler.